Perhaps there were far better things to do in 1970 than look at the sky. After all, Man had already been to the Moon twice – to the elation of billions – but the near-loss of Apollo 13 tempered the excitement with a reminder that space was the ultimate hostile environment. There were more pressing situations to be addressed on Earth, and particularly at the street level, as student uprisings in the Western nations alternated with free festivals, singing songs with a decidedly political descant to them. Mexico entered the new decade reeling from the brutal suppression of activism at Tlatelolco in 1968 – weeks before the Olympic Games slated for that year – and a government in transition. The same upheaval in music, politics and consciousness was to be found there, and in such a state of affairs, no one was surprised that “los marcianos” – the Martians, everyday parlance for the concept of “space aliens” – had taken an interest in terrestrial matters, whether to lend a hand or laugh at foolish humanity. The intense UFO activity of the mid-to-late Sixties carried into this new decade as well, with the generalized belief that human space activity had attracted the notice of space-faring civilizations, perhaps unmindful of the fact that the same had been said about nuclear activity in the ‘50s. Were these putative aliens worried that the noisy neighbors with their atomic firecrackers now threatened to bring disturbance to their worlds? While these and other affairs entertained the thoughts of people in the big cities, UFO activity was taking place far from the sodium lamps, the urban sprawl and the nightlife. On 18 February 1971, frantic calls from local residents were received at the newsroom at the “El Siglo” newspaper in the northern Mexican city of Torreón. At 22:00 hours a “flying saucer” had become visible to the southwest of the city, appearing at first as a bright spot in the skies and later increasing in size, changing color from yellow to pink and leaving a wake that remained in the sky for several minutes before the intruder vanished. The newspaper sent out reporters to interview the witnesses, and while most agreed on what they had seen, they were equally certain that they had not seen a meteorite, bolide or anything similar, as these did not initially appear to be small, then larger, and leave luminous wakes that remained for several minutes. Journalist and UFO researcher Santiago García interviewed Andrés Barraza, a mechanic who had been among the witnesses of a significant sighting on 29 January 1971. Barraza said that objects involved in the multiple object sighting “had a strange glow to them, and their speed was around 200 kilometers an hour.” When asked how he could be so sure of their speed, he replied that as a mechanic, he was a keen observer of the speeds of a car or any object in motion. García would go on to acquire a measure of renown for his investigations of the “Zone of Silence” near the town of Ceballos, Durango, and eventually had sightings of his own in this largely inhospitable region. 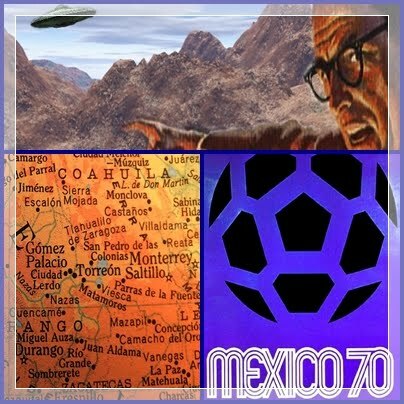 In November 1972, while looking into other UFO cases in northern Mexico, he boarded a rickety rural bus to reach the village of Jimulco in the state of Coahuila. The three unknown devices may have been as startled by the human’s appearance as he was by theirs. They rose vertically to a height and then flew off from the outskirts of Jimulco at what García describes as “frightening” rate of speed, which he placed at four hundred kilometers an hour. What he found most astonishing from this encounter with the unknown had nothing to do with the objects, but rather with the fact that he had forgotten to bring along his camera, “my inseparable companion in research,” as he described it. Fearing that people would choose not to believe him if the told his story, he later discovered that there had been other witness to the trio of unknown objects. As it turned out, elections were in full swing for the office of the mayor of Jimulco, and a delegation of politicians and advisers, including the candidate for office, the state governor and other grandees, had seen the phenomenon from their campaign bus. Pedro Rojas, a county official, was part of the delegation and later told García that the politicians had all seen the three objects. Rojas himself had never paid much attention to the UFO phenomenon, but the sighting on 16 November 1972 certainly stirred his interest. Anomalous activity would spread to the neighboring state of Chihuahua – Mexico’s largest – in the months following the events in Coahuila. On 15 August 1973, the Heraldo de la Tarde newspaper featured a UFO report received from Rogelio Yapor, an employee with the social security office in Ciudad Cuahutémoc. Mr. Yapor was driving along the road toward Ciudad Cuauhtémoc with his family when he noticed a very large luminous object (with estimated diameter of fifty meters – in excess of 160 feet) hovering not too high up in the sky. The staff at the Heraldo de la Tarde’s newsroom would have probably dismissed it as otra de marcianos – just another Martian story – but the fact that Yapor had placed a very expensive long distance call to their office made them suspect that the eyewitness was telling the truth. Antonio Cantú was among these witnesses. From his home in the El Roble district, he was able to see a luminous object hanging motionless over the peaks of Cerro de las Mitras, an impressive geological formation (http://en.wikipedia.org/wiki/Cerro_de_las_Mitras). The object would remain suspended over the mountain before shooting off at high speed – and immediately after, the air in his neighborhood would become filled with fog or fumes that were attributed to the unknown device’s takeoff or landing. Fortunately, Mr. Cantú was not alone in his statements. From another residential district – Colonia San José – Mr. José Lara had also seen a strange object land on the summit of Cerro de las Mitras in the evening. “It was a bright object, emitting a very powerful beam of light, remaining motionless until it set off at considerable speed.” Other witnesses reported in person to the newsroom of El Norte to inform the staff of the anomalous events playing out on the summit. Alberto Taboada, driving at night along the road linking Monterrey with Laredo, Texas, was near the town of Sabinas Hidalgo when his car became awash in an intense, unearthly light. Rather than pulling over, he continued his journey into Sabinas, reaching a filling station owned by Mario Ancira. Both men were able to share the sighting of numerous objects flying in a north to south direction, heading to Monterrey. Of further interest is the fact that both men observed the objects “falling to the ground” after covering a certain distance. Taboada continued his journey, and was able to see objects falling the vicinity of Cerro Mamulique. The lights in the sky were not always inclined to play nice, to judge by some of the journalistic reports available from the time. In May 1973, Manuel Ruelas and Martín Antonio Luque from the vicinity of El Aguajito in the state of Sinaloa, were chased by a “flying saucer” as they made their way at three o’clock in the morning on a mule-drawn wagon, returning from a fish market. Upon reaching a wilderness known as El Vallado, both men saw a flying object hurtling toward them out of the darkness, casting an intense yellow glow that lit up an area greater than two meters around it. According to their story, the object approached them to the point that they were completely engulfed in its light, flying away and then returning to continue its game. Ruelas and Luque lost their nerve and jumped out of the wagon, running into the brush and abandoning their cargo of fish – and the mule -- to its fate. Vidal Cota, a magistrate from the town of Higuera de Zaragoza, reported to the scene of the UFO “harassment” and found the tracks left by the two peasants as they ran for cover, and fish that had fallen to the ground after they fled. No word on the mule, though. Although no date is given for the next and most impressive events, it was featured in the El Sol de Sinaloa newspaper and occurred with days of the May 9, 1973 event involving the peasants and the cartload of fish. Aaron Irizar, 22 at the time, was a business major at the Universtity of Sinaloa who had experienced an encounter with the unknown while in the company of a friend. His story was given short shrift at first, due to his age, his status as a college student, and the chance that he might have been smoking drugs. Five residents of the city of San Luis Potosí witnessed the maneuvers of an orange-red UFO flying over the city late at night in January 1975. Their description of this phenomenon characterizes the physical description given of most UFOs seen over this part of the country: the object resembled a ball, giving off an intense shine that resembled fire, as if the object were ablaze. Two such fireballs were seen by Jesús Aguiar in Baja California: while the young shepherd looked after some burros on a ranch called El Guayabo, he noticed two fiery-red balls heading toward him nearly at tree-top level, maneuvering as if to avoid hitting the trees. Aguiar added that an intense burning smell filled the air after the objects went past him. On February 29, 1976 a family on its way to inspect a recent snowfall (a rare occurrence in Mexico due to the high elevations) at a location close to the community of El Chico in the state of Hidalgo. Parking their car by the roadside, the group entered the woods, heading toward an area used for picnics in warmer weather. At around 8:30 a.m., one of the children shouted that a strange object was suspended in mid-air. Having brought along photographic equipment to take snapshots of the elusive snow, the boy's father swung his camera heavenward to take an impressive sequence of photographs, just as the saucer-shaped craft began to exhibit the classic "swinging" motion that has characterized these vehicles. The photographs remain one of the most important documents ever collected on the UFO phenomenon. Activity of this nature has always been common in this part of Mexico, perhaps owing to the fact that a number of large active mining endeavors in the region. The connection between UFOs and mines has also been observed in Puerto Rico, where the test pits dug for copper near the town of Adjuntas attract their interest. A UFO in Cañuelas, Argentina?